At Sunbury Village Council, Ordinance 2015-11 and 2015-12 have been tabled longer than ordinances which sit on the table while details are worked out, over three months. Ordinances 2015-11 (an annexation agreement) and 2015-12 (a petition for annexation into the Village) are for a 250.632 (plus or minus) acre parcel located west of I-71 in Berkshire Township is an Expedited Type II Annexation with multiple ownerships. The parcels owners are: Dorcy Oil Company; MTB Corp.; Northstar Equities of Ohio, LLC; Audre M. Goodwin, Christine Goodwin Oster, Custodian, and Thomas B. Goodwin, Custodian; Katsumi Tanaka and Kazuko Tanaka, Trustees of the Katsumi Tanaka and Kazuko Tanaka Revocable Trust; K&K Ventures, LLC; Carl and Delores Rogers Investments Ltd.; and James D. Klingbeil and Sally A. Klingbeil, Trustees of the Klingbeil Trust Dated April 24, 1990. Both ordinances had a first reading during the March 4 Council meeting, went through three readings, and have sat on the table since April 1 while property owners and attorneys fine-tuned the annexation agreement’s terms. Without Council first approving an annexation agreement, the annexation could not receive an up or down vote. The Dorcy Oil, et al, annexation impasse came to an end during last Wednesday evening’s Village Council meeting when Council members un-tabled both ordinances, approved the annexation agreement, and then approved the annexation petition. Council members approved language modifications in Ordinance 2015-11 (the annexation agreement) and approved both Ordinance 2015-11 and Ordinance 2015-12 (the annexation) with emergency language, sidestepping a statutory 30-day waiting period and making both ordinances immediately effective. With the annexation approved, Sunbury residents woke up Thursday morning living in a Village that extends west as far as 3 B’s and K Road. 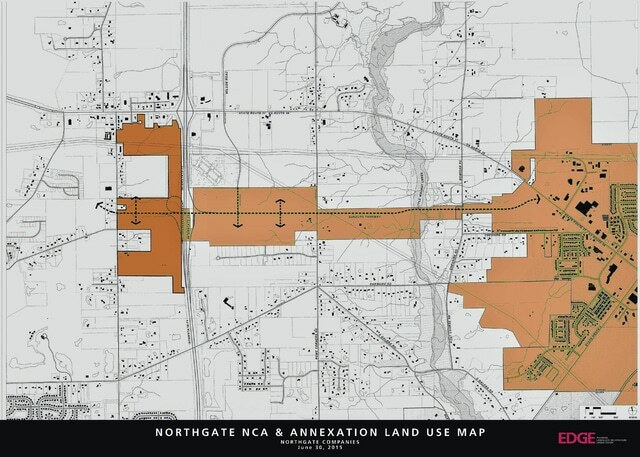 In a press release on Thursday, Phil Craig, representing the NorthGate Land Consortium that plans to develop the land when an I-71 Interchange is constructed immediately south of the existing I-71 and US 36/Ohio 37 intersection, stated that the approval of the annexation caps an almost seven-year process to prepare the property surrounding the new outlet mall for development. Craig said NorthGate will move forward with sales and leasing of property for development; and that further development announcements would be forthcoming over the next few months. The relationship between NorthGate and Sunbury had already been formalized. During a February 28 public hearing and special Council meeting, Village Council members approved a New Community Authority (NCA) to collect various forms of tax dollars and charges on new development by NorthGate Land Consortium I LLC to pay for public infrastructure as NorthGate develops. In addition to the Village of Sunbury benefitting from terms in the Sunbury/NorthGate NCA, other taxing districts that will receive funding as NorthGate grows include the Big Walnut and Olentangy school districts, the Delaware Area Career Center, Community Library, BST&G Fire District, Preservation Parks, Delaware-Morrow Mental Health, Delaware County Health District and Delaware 911 District.